A great line up of ASIS Foundation events awaits you this year in Vegas. Sunday 23 September – the annual golf tournament will be held at The Bali Hai Golf Club 5160 S Las Vegas Boulevard – tee time is 0800 with lunch 1300-1430. Also on Sunday 23 September – The Foundation Reception will be at Brooklyn Bowl, 3545 Las Vegas Blvd South at 1800 – 2200. 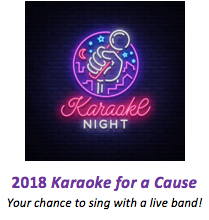 A Karaoke challenge cheer on your favorite with your donations to the Foundation – ohh and btw this Brooklynite won’t be singing so no fear there. On Monday the 24th of September– come to the awards luncheon at noon and don’t miss the Karen Marquez Honors at 1730-1900 in the Westgate Pavilion 10, where this year’s awardee is long time thought leader and educator Linda Florence. On Tuesday the 25th – photos with chapter donors in the Hub at the exhibit hall will be taken. Check for times chapter leaders.